To date, the UN has held, four world conferences on women to take stock of the status of women and to outline proposals for future action to advance women’s rights. The first of these was held in Mexico City between June 19 to July 2, 1975 and was the first ever UN conference to focus solely on women. The World Conference of the International Women’s Year, as it was called, was a tumultuous and ground breaking event that brought global attention to a multitude of issues raised by the 133 countries represented at the official conference and the over 6000 civil society participants in the parallel International Women’s Year Tribune. As 73% of the delegations were women and were primarily headed by women, the conference brought many women into the UN’s orbit for the first time. Both the inter-governmental conference and the NGO Tribune also introduced activists to the potential of pursuing their interests through the UN at a time when there were few international venues for women’s rights. 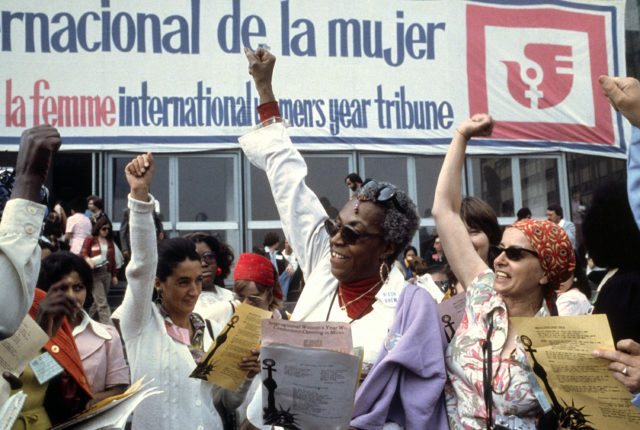 It also connected women from around the world to each other in an unprecedented manner leading to a surge in women’s rights activism and the formation of women’s networks around the globe. The conference developed a World Plan of Action for Implementation of the Objectives of the International Women’s Year as a set of guidelines for the advancement of women through 1985. The conference proceedings also culminated in the Declaration of Mexico on the Equality of Women and Their Contribution to Development and Peace, which outlined the impact of national foreign policies on the lives of women.